Volume Discounts apply to this product just add your quantity. The Isosonic mat is a cost effective means of achieving soundproofing against impact sound. The Isosonic acoustic mat is a very versatile product which can used with a number of overlays , it is excellent at reducing impact sound while maintaining a firm non spongy feel to the floor. (This spongy feel is a frequent complaint amongst users of other rubber mat treatments.) It is our view that the decibel rating quoted by many thinner 3mm underlays is dramatically overstated and their performance is significantly inferior to the Isosonic mat when tested in real world situations ( as opposed to lab test conditions). When used in conjunction with our Tecsound 50 or Tecsound 70 acoustic membrane the combination can provide a very meaningful improvement in airborne and impact sound for newly laid laminate and engineered floors. The Tecsound 70 is a 3.5mm mat as opposed to the 2.6mm Tecsound 50. The extra mass of the Tecsound 70 should add around 4 dB more acoustic protection in comparison to the Tecsound . Customers wishing for further airborne soundproofing can also add acoustic mineral wool beneath the floors boards. 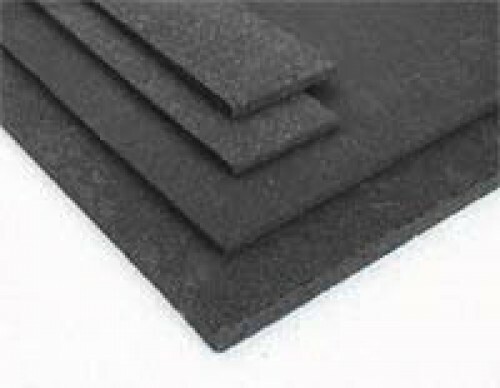 Remember that with all underlay rubber mats the improvement quoted is only an impact sound improvement and that they will have very little airborne sound reduction qualities. Isosonic acoustic mat is a versatile and cost effective method of significantly reducing impact problems associated with laminate floors. The Isosonic mat is a high quality cost effective method of reducing impact sound beneath laminates and structural engineered floors. It can also be used as a method of improving the impact qualities of any carpeted floor acting as an impact resisting layer to go under existing carpet underlay. This versatile product can also be laid under screed to isolate a cement sub floor . So reducing the impact sound associated with solid cement floors. We are regularly asked by householders about replacing carpet with laminates in their properties. The question is often whether the use of the isosonic mat underneath laminates will "be as good as carpet" as often specified in building leases. There is no simple answer to this, as the quality of the original carpet, its underlay and sub-floor all have a bearing on how the original carpeted floor is performing. Some carpets will perform well, and others badly from an impact sound perspective. Where a poor carpet is in place, the isosonic mat and laminate might out perform the existing carpet. The isosonic mat truly transforms the acoustic qualities of a laminate floor and improves internal room acoustics as well. The key difference with this and many other mats on the market is its relative firmness. This means that is ideal to go under products such as laminates or engineered floors without creating too spongy a feel. It is also very cost effective compared to many other impact mats on offer. It remains the number one choice for those laying laminate floor but wishing to deaden the impact sound they are generating to neighbours below. In applications where it is laid under laminate floors it also improves the internal room acoustics, softening the general noise levels generated in the room. For this reason it is one of our top sellers as a superior laminate underlay. If you are also looking to improve the airborne (TV and talking ) sound soundproofing between rooms, (say between two flats) then adding a layer of Tecsound 50 or Tecsound70 is an excellent choice. NOTE: where noise from below is your problem you should be concentrating on getting the maximum arirborne uplift you can. Rubber mats vastly improve impact sound reduction ( benefitting downstairs neighbours they are not as good at reducing the sound coming up, hence our recommendation for Tecsound). This is a very simple product to fit. Simply cut to size of the room, where possible avoiding gaps and spaces. The new laminate engineered floor is simply laid over the floor and fitted as normal. If laying this type of floor there is no need to add any further type of underlay. The Isosonic mat is not normally glued to the sub floor, as it lies in place under its own weight. Where the need to glue is specified then isobond adhesive can be used or any other water based acrylic glue. Please note that solvent based adhesives should not be used. The mat can be turned up at the perimeter of the room if required to act as an integral flanking band and excess trimmed off. This is normally only necessary where a chipboard floor is being laid over and high traffic is expected. The Isosonic mat has very little thermal resistance so underfloor heating can be present in contact with it either above or below. Best practice when using underfloor heating is to have a layer of PIR insulation, such as Celotex, at least 20mm thick, then overlaying it with the Isosonic mat and then the underfloor heating. This will reduce any heat loss downwards.